new, originally uploaded by Green Biker. intimidation and it is out of control. letter, and I have continued to be one of your most ardent supporters. myself what was really happening. So, I joined the ride tonight, and what I witnessed was simply appalling. preposterous anti cyclist policy has now forever changed my opinion of you. anti-cycling police tactics. The other payment went to your opponent C.
will be sure to do another Critical Mass ride. If you think your constitutional rights were violated when you were arrested during the Republican National Convention last summer, and you want bring your own individual lawsuit for money damages, and do not have a lawyer, may we offer you the following information. 3) subjected to inappropriate detention conditions, especially at Pier 57. However, the federal court must first “certify” each of the three proposed classes, i.e., that each alleged class meets lawful criteria to be a class claim. If the court certifies a class and you meet the definition of that class, you may eventually recover money damages as a member of that class. However, if the court does not certify a class, there will be no recovery. For example, if the court does not certify as a class all of those claimants unlawfully arrested, then the class action lawsuit will not be able to seek money damages for unlawful arrests. Thus, you would have to file a timely individual lawsuit to seek damages for your unlawful arrest. Also, the federal court may not decide which class claims to certify until after some deadlines for state claims have passed. For more information regarding the class action lawsuit, contact the law office of Moore & Goodman at (212) 353-9587 or email to jbadalu@gis.net. Attached are two tables. Table 1 is a list of attorneys from the National Lawyers Guild who are presently representing RNC arrestees in individual lawsuits arising from various RNC arrest locations. They are available for consultation regarding possible representation in a civil suit. Table 2 identifies the locations of arrests for which these attorneys are currently representing, or are prepared to represent, RNC arrestees. If you have any questions regarding individual lawsuits, please contact us as soon as possible. I wasn't going to go on the ride last week being that i am pregnant, but after going to the rally and seeing very little police presence i thought it would be peaceful, like the many rides throughout the years that i have done with my teenage daughters, we are all avid bike riders. 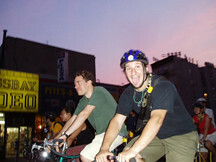 I have been a NYC bike rider for many years (over 25) , I dont consider critical mass as a political event, it is about my love of bike riding in my own city and my chosen form of transportation. I do not drive. Well.... I went on the ride and obeyed all the traffic laws , stopped at all the lights, which was horrible!! it stopped being a united ride about 10 minutes in and small groups of 10 or less were mingled in with traffic. I was arrested at 14th street after stopping at the light , I saw the cops riding the wrong way into traffic and even though i stopped at the light and even got of my bike i was tackled visciously by a pollice officer in a white shirt, I was cuffed manhandled and taken into custody . I have never been arrested in my entire life and still cant believe this happened. What the hell is happening in this city. John's letter to the Mayor echoed my sentiments to the T. On every point I too supported the Mayor, and for the life of me cannot fathom the policies of his administration as they pertain to CM. I have been riding CM since '96; my very first ride was an incredible experience. The pure joy of riding through the city I was born and raised in, amongst a happy group of people is difficult to explain. Friday night was important to me because I finally had been able to convince my best friend to join in - he had a blast. Thankfully he survived, but friday night was the closest I've come to arrest in my life! A scooter cop was no further than 20 feet away from me, barreling in head on with an outstretched arm hoping to wrangle me down! As they say "I rode it like I stole it" and managed to get away only by breaking the law for the first time that evening! It is absurd to think that for 2 hours a month this city can't find a way to support this group and it's peaceful activity. This won't change until the mayor changes the policy of NYPD. Start writing!!! !